The third instalment of this fantastic series is finally here! Soapy Thompson’s dad wins a world cruise for a family of five and Soapy convinces his parents that best friends, Arvo and Loogi should come along to stop him going mad with boredom.As they cruise past the East coast of Africa there is a great commotion in the dead of night and Soapy discovers that pirates have boarded the ship and taken two hostages – his parents – and are demanding GBP1m in cash. 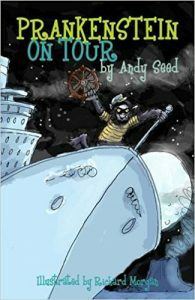 Soapy knows that his only hope is to unleash Prankenstein – his prank-crazed alter-ego and the adventure out at sea really begins. This is the third book in the Prankenstein series, about Soapy Thompson, a young boy with an alter ego. 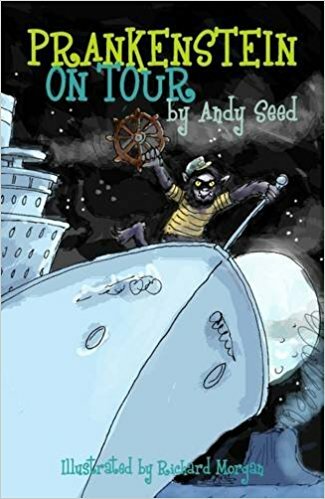 I haven’t read the first two in the series, but as I am doing an event with author Andy Seed, I thought it only right that I should acquaint myself with the latest book, and I am very glad that I did. Soapy, his mum and dad and his two friends go on a cruise, where things start to go wrong almost immediately, and Soapy has to call on Prankenstein to sort out the mess. Unfortunately, once Prankenstein has been released he is a very difficult character to get rid of. And his antics leave you roaring with laughter. When Soapy goes missing,it is up to his two friends Arvo and Loogi, and the two girls they meet on the cruise, Minty and Ursule, to try to save the day. This is a fabulous read for all children aged between 7 and 11. But I strongly suspect that if you have a reluctant boy reader then this could be the series to get them interested. There is humour on every page. I personally loved the characters of Arvo and Loogi, from Estonia, and the dialogue between them and Soapy is hilarious. As well as the humour,the story of the boys’s adventures is extremely readable. Which is a big help if you are a parent helping your child with his/her reading. I would highly recommend this series, and although this book can be read as a standalone, I think children would love to start at the beginning with Prankenstein and follow his adventures through the series. Andy Seed is an author and poet, living in North Yorkshire. He writes memoirs, funny poems and humorous non-fiction books as well as all sorts of things for teachers. Andy’s most popular book for adults is All Teachers Great and Small and his most popular book for children is a non-fiction book, The Silly Book of Side-Splitting Stuff, which won the 2015 Blue Peter Best Book with Facts Award.